Multiple warnings about the dangers of the ammonium nitrate used in Takata airbags went ignored to save just a few dollars per airbag, according to a report by The New York Times. To date, faulty Takata airbags have killed at least 14 people and injured over 100 more, prompting the largest automotive safety recall in history. 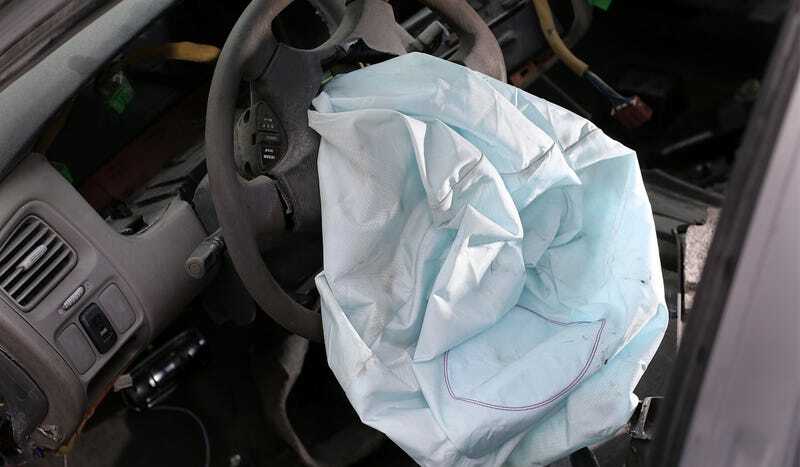 Former Autoliv scientists told the Times that their findings about Takata’s airbags were so damning that they understood that Autoliv had tried to warn automakers of the danger of Takata’s inflaters. GM declined to comment, saying essentially that it was an “old GM” problem. Of course, GM was hardly the only automaker who prioritized price over safety. Other automakers also pressured their suppliers to produce airbags as cheaply as Takata, per the Times. While most automakers declined to comment to the Times, Honda spokesman Matt Sloustcher claimed in an emailed statement that “There was no industry understanding in the late 1990s” that ammonium nitrate was dangerous to use. And Takata themselves had been under their own push to do things cheaper and move more product at about the same time, per the Times’ report. Takata airbags that inflated too fast in the 1990s were linked to at least 40 eye injuries, crippling sales. Worse yet, explosions at a Takata inflater plant in Moses Lake, Wash., forced the company to fill its orders with other suppliers’ inflaters at high cost. Automakers play a big role. They’re expected to be involved with their suppliers in a very detailed way. Takata claims to have made their new inflaters more resistant to moisture and temperature changes. Given their scandal-ridden track record so far, I can only hope it’s true. You can read the Times’ full report here. Automakers: Get Excited To Share Takata&apos;s Gigantic Recall Costs!